3) My organic rankings are very solid too. I’m not number one for my main keywords but I’m in the Top 3, Top 5, etc., which is good enough for me. The thing is, I will probably NEVER be number one in the search because the prices I charge for my products are higher than the market average—and that’s fine by me! Expand to other/international Amazon marketplaces. As I already discussed in previous posts, this particular business will be fixed around a specific niche and I won’t be adding new products to it (not yet anyway) as that would skew the growth numbers, etc. Personally, I would much rather concentrate on expanding the business and sales via international Amazon marketplaces and, possibly, into offline sales in the future too. I’m one of your Amazon Sharks customers who joined the program when the course was launched in January this year. I just wanted to email you and share some results and ask for advice, if that’s ok? Long story short, I watched the Amazon Sharks videos, took immediate action and, in February, I sourced my first product. As my budget was just £1.5k, I picked a small, cheap product that was sent to me from China via TNT courier. In early March, I listed the product, followed your PPC advice and almost immediately started to generate sales from day one. Within few weeks’ time, I was selling between 10 to 20 units each day @ £9.99 (same price tag as yours. Thanks, it works amazingly well!!!). By the end of April, I think I have reached maximum sales I can have with this product. I have lots of organic placements, my ads show up for all major searches, etc. I don’t know how I can increase sales further without overspending on ads, on less targeted keywords or maybe the lowering price? But I don’t think it will work out as the current price gives me a good margin and my conversion rate is at around 20%, which as I understand is good enough. I realise that this was very quick progress, mainly because competition for this product was almost non-existent and my supplier has been great so far—very few quality issues and returns. I am making around £800 to £1000 profit after all the fees per month now and wonder what’s the best way to expand my business? Should I find another product or maybe start selling this product on Amazon Europe? Or Amazon.com? Any advice would be appreciated and thanks again for creating this course—it works exactly as advertised and I could not have gotten this far, this quickly, without your training, Andrew. What would my advice be to Stuart and people in a similar situation? Is it best to introduce new products or to expand internationally? I’ll answer that very question in a moment, but for now, let’s first quickly cover my May 2018 results to stay on track with the numbers! 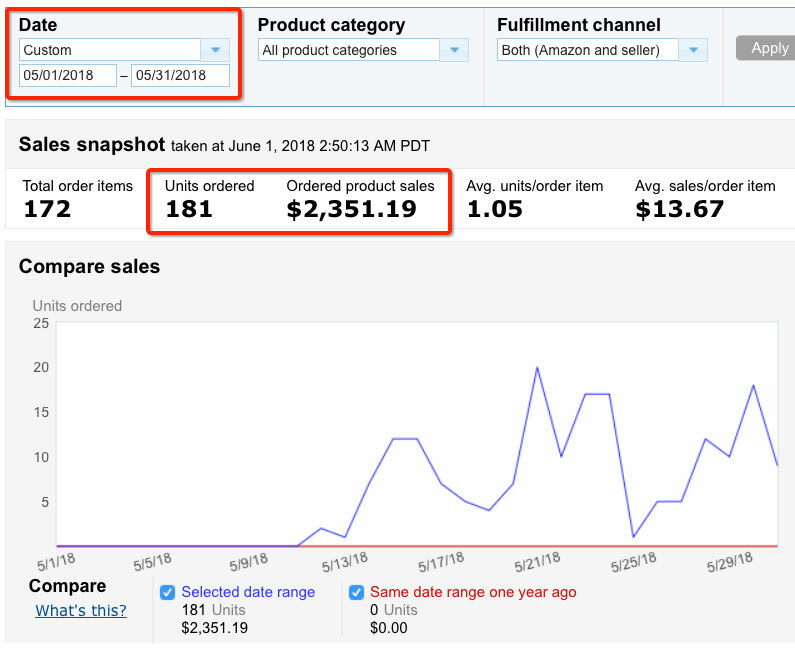 Ok, let’s take a closer look at my Amazon FBA business results for May 2018. These numbers only include sales generated from this one business on the Amazon UK platform. So, basically, this would be my NET profit per unit sold if I wasn’t going to spend any money on ads. But, of course, I did spend money on ads! Running Sponsored Product ads on Amazon is absolutely MANDATORY to maintain your sales velocity and organic rankings. I have said this many times over and proved it once again with my April sales. Please learn from my mistakes: lowering ad spend too much can negatively affect your organic rankings and, in turn, lower your overall sales and profit. So, I spent £1,983.62 on Sponsored Product ads and maintained a relatively good ACoS of 41.54%. My breakeven ACoS is 40% for this product, so I’m making a small loss on ads BUT most importantly, these extra sales help me with organic rankings,which generate most of my sales. Apart from Sponsored Product ads, I also run Headline Search ads. These ads are only available to sellers registered in Brand Registry. You will see them run across the top part of the search results as well as in various other locations on the Amazon platform. That is almost £4k in net profit on a £15,639.46 turnover, which equals to 25% NET margin. Which, in my opinion, is a very good result for a £9.99 product on Amazon. (Sometimes the total number in my Amazon reports is slightly different due to returns and refund adjustments, which can happen weeks after I have created my monthly reports and blog posts). New Product or Expand Internationally? 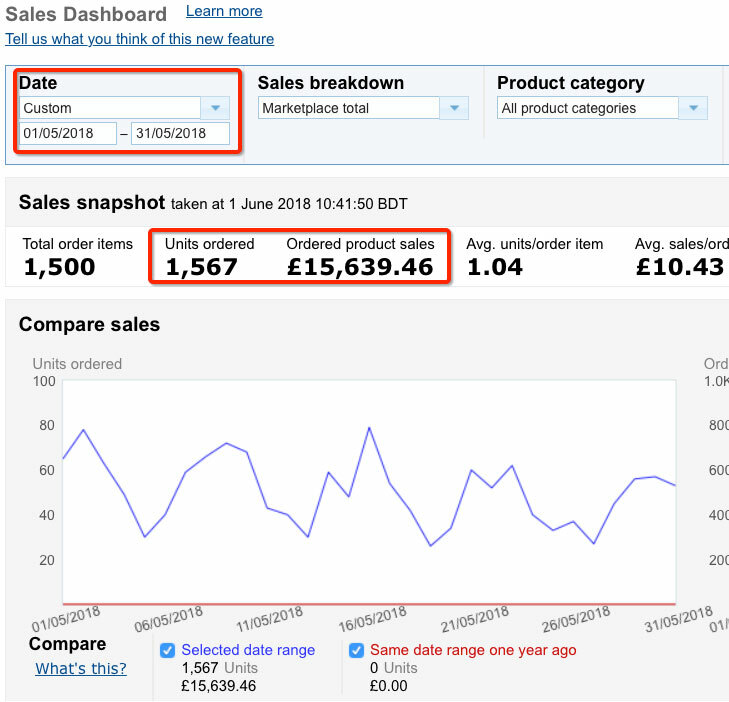 Now that we’ve got the monthly update out of the way, let’s go back to my student Stuart’s great question on what to do when you’ve reached your maximum potential sales for a product on Amazon UK (or whatever platform you have started with). Should you introduce new products OR expand internationally? There’s no definite answer to this and, in reality, both scenarios can work out quite well. What I recommend in a situation like this is to FIRST evaluate the second scenario: expanding your current product or product range to international markets. When I say “evaluate,” I mean do product research using Jungle Scout on those international platforms to see how well the product sells there and what kind of competition you are potentially facing. If you discover that your product sells well on Amazon.com and the competition is at reasonable to low levels—GO FOR IT! You already have a product and supplier sorted, you’ve already taken great product images, written great descriptions that work, and you’ve done all the keyword research already. With all this work already done, it is SO MUCH EASIER and more efficient to simply start selling on another Amazon platform (if the demand exists) than to start from scratch with a completely new product. Using Jungle Scout and Google translate, you can easily find the relevant sales numbers for your product on the European Amazon websites and analyse the potential competition too. If everything looks good, consider using one of Amazon’s European FBA programs or just do a trial with it. You can test this idea out for a period by using Amazon FBA in the UK to avoid VAT registrations. For more information on this, check out my ultimate VAT guide for Amazon sellers. The idea is very simple: IF there’s good potential for your product on other platforms, start with those! 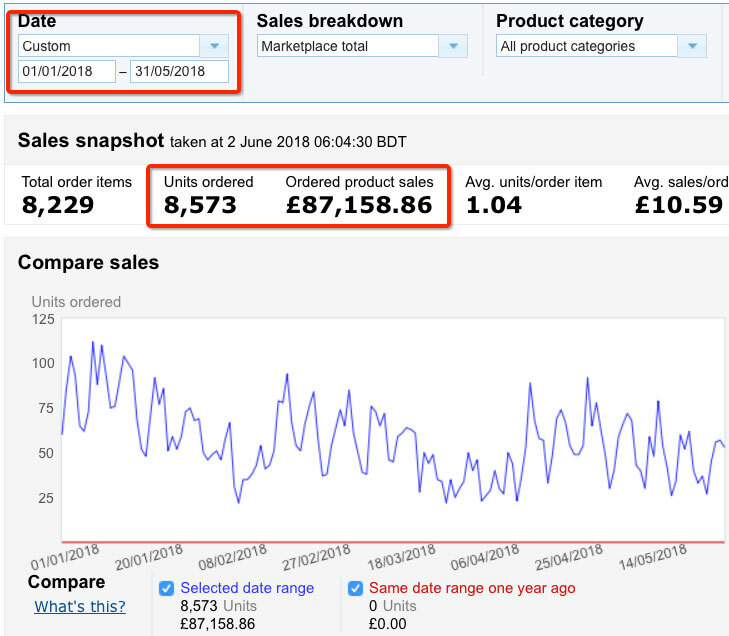 On the other hand, if you see that demand is weak for your product on other Amazon sites AND/OR the competition is very high, then it’s probably best to work on introducing a new product to your product line and continue selling that first product solely on Amazon UK. Then, with the second and third products well-established, you can re-evaluate your international expansion plans once again. And, of course, the biggest of all is the US site, Amazon.com, which also offers the biggest opportunities and access to more than 300 million people!!! 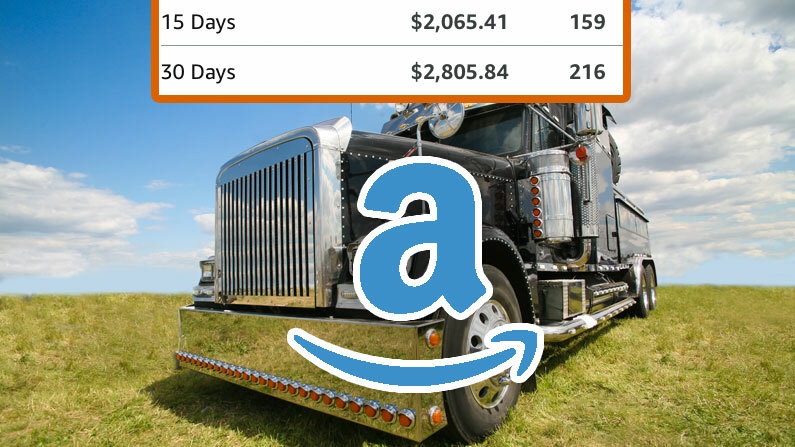 With this in mind, my next logical step was to expand my business to Amazon.com—and that’s exactly what I did! At the time of writing this, I have about 15 product variations on the Amazon UK website. It’s essentially same product but with slight design variations. A good example to think of would be duvet sets with different designs and patterns. I did not want to risk sending too much inventory across the pond because the competition for my product on Amazon.com is massive. Instead, I decided to send off my five best-selling variations based on the UK sales results. 181 units sold, which is $2,351.19 in sales. On the Amazon UK platform, I sell this product for £9.99. If you do a direct exchange, you get a dollar equivalent of around $13.50 or so, but since I really wanted to keep the price relatively low, I decided to set it at $12.99. However, the majority of the sellers in this particular niche charge in the range of $7.99 to $9.99 for similar products. That means I’m one of the most expensive sellers in this category on Amazon US platform. 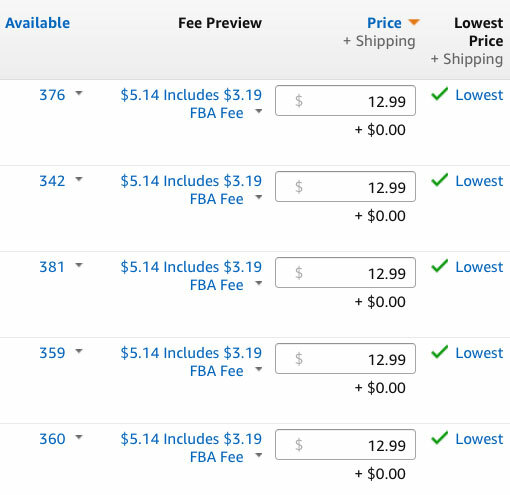 The actual product cost, including shipping to the US, is $2. That’s using air freight and sending a pallet with 2000 units at a time. I could get this number down by using sea freight, but I really like the speed that air freight offers, especially in the beginning phase when I might need to quickly restock depending on the sales results. So, I’m more than happy to pay a little extra for air freight this time, especially as my margins are so good anyway. A total product cost of just $2 for an item that sells for $12.99 is not bad at all! I made more than $1,000 in my first three weeks of selling a brand-new product on Amazon.com, with NO product reviews, no feedback and no sales history! Of course I didn’t! I was also running Sponsored Product ads, which obviously costs money. When you launch a new product on any Amazon platform, the best, quickest and easiest way to get it going is to simply start running Sponsored Product ads right off the bat. Set your bid prices high—HIGHER than what Amazon recommends. For example, for this product, I set my bid prices to $2 per click, while Amazon only recommended an average $1.50. Then, you simply wait it out for at least two weeks. Just wait and watch to see what happens. In the first days or first week, you will be spending lots of money on ads, resulting in relatively few sales. You have to stick with it because it’s a cumulative result. Each day, it will get better and better as your sales velocity increases and you start to rank somewhere in organic search results too. It is a fairly simple strategy, but it works. Obviously, there are lots of ins and outs and finer details to this—something I cover in great detail in my Amazon Sharks course—but for now, it’s just important that you understand the basics of what I did here. YES! That’s a LOSS of $98.08. And this is perfectly normal! In fact, it’s exactly what I expected. In the beginning, you almost always have to accept loses when you use Sponsored Product campaigns to launch a product, that’s just how it works, unless there’s very little competition. As you can see, my ACoS for ads is more than 100%, which means that I’m spending more money than I make in return on these ad sales. By the way, at the beginning of this post series, I calculated my ACoS breakeven point for the Amazon UK platform, and it was 40%. (Breakeven ACoS means the maximum ACoS level where I don’t make any money and don’t lose any money. If ACoS goes above this level, I’m making a loss). So, let’s quickly calculate my breakeven ACoS number for US sales! My net profit from each sale is $5.85 (after the product cost, shipping to Amazon and Amazon fees). The items are selling for $12.99. I can spend $5.85 on ads to break even. Anything less than that and I’m making a profit. That means my breakeven ACoS is 45%! With this number in mind, my ultimate long-term goal will be to get that ACoS number as close as possible to 45%. Ideally, I want to go below it so that I make a profit on direct ad sales, plus, of course, increase my sales velocity and organic sales as a result. It’s the very beginning of my Amazon.com journey, so I can’t wait to share more results and how I’m getting on with this expansion! The US expansion is my number one priority right now. The idea is to wait it out and evaluate the June sales. Essentially, I want to get at least few reviews in using natural sales, current ad spend, and using the Early Reviews program. If that doesn’t work out and if I don’t have those reviews in by the end of June, I will probably do a discounted giveaway for the sole purpose of getting some reviews. Once the reviews are in, I will increase the ad spend, start doing Headline Search ads and I’ll also start sending some more variations of the product to increase the variety of options available. As I got into the Brand Registry from the very beginning, I have already created my Amazon Store and set-up Enhanced Listing Descriptions. My next step will be to further optimise how the store looks, but I will probably wait to do that when I have more variations in stock. There are lots of things to do, lots of information to cover, and I will do my best to keep you updated on what is going on! Summertime is usually the slowest sales time for most product categories because it’s the time when most people take holidays, etc.—including ME! Yes, when you read this post, I will probably already be in sunny Marbella, taking some time off with the family to recharge for the next six months of the year! So stay tuned for that post and if you want to see a pic or two from my vacation, make sure to check out my Facebook page here! What type of sales firgures do you look for ? You mean 1867 sold units OR £1867 in sales? if units, that’s good enough. If £££, then it’s a very low volume item…. but if it’s your first product and there are only 2 competitors AND your budget is very limited, it still could be a good product to get started with! £649 is very, very low. Thank you for all your wonderful advice, I have 3 samples on the way of product one and hopefully when trademark is confirmed later this year. I will be ready to launch the brand. Due to limited funds and I can only purchase small number of units (200), how do you work out a ppc budget? If I reach my target price, ROI will be around the 80% before ppc. I’ve worked out £36 per day for the first 14 days is what I can afford to test the market and if getting decent acos I can increase the budget. Or would it be better for me to do 7 days at double the budget and then refine? No, I would rather plan a 14 day budget than 7 day budget for PPC. 7 days may not be enough for you to even stat optimising your campaigns. It’s hard to say how much money you will need for PPC as it pretty much depends on competition and click prices BUT your £500 planned budget should be enough, yes, to get started. And remember to set the charge method from your seller account so that you actually fund those clicks from actual sales you make. I’ve been following you since the days you realeased EAB. Would you say selling on Amazon is the new eBay? I remember you used to heavily push eBay but now the majority of talk is about FBA, not just from you but other sellers as well…. I have recently been following your success stories. I always wanted to do my own online business but life always took over. However, I am now in a position to start something little do I can gain some experience and then move onto bigger and better things. I have no experience on selling anything online apart from the odd few used items on eBay. I wanted to start on eBay first and I’ve been reading a lot of your hints and tips. I’ve come across your Amazon Sharks now and I’m thinking should I carry on with eBay or shall I take a chance and go into Amazon Sharks. I can only dedicate about 8hours per week for now on this and I’m looking to make anything between £600 – £700 profit per month. Hi Andrew, I recently watched your most recent Amazon sharks video over on YouTube and one of the advantages given of FBA was “relatively low start up costs”. My question to you is how much would you recommend starting with? You can start selling on Amazon using FBA and private label concept with as little as £500 to £1000. The more you have, the better of course as with a small budget you will be limited to what product you can sell (small & cheap – BUT not always!!!). If you have a budget of £2k – £3k, you will have more options. With a budget of £5k – £10k – even more options and so on.